CAOIMHGHÍN Ó CAOLÁIN TD was Director of Elections in the H-Blocks general election campaign of 1981 when Kieran Doherty was elected TD for Cavan/Monaghan. Kieran later died on hunger-strike in the H-Blocks of Long Kesh. 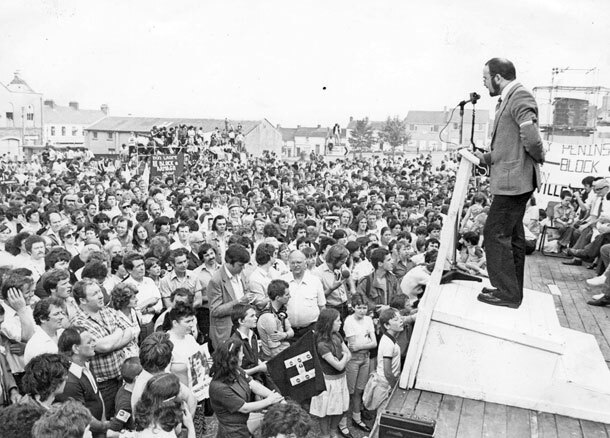 In advance of the National Hunger Strike Commemoration coming to Monaghan Town in August, Caoimhghín reflects on the 1981 period and on its legacy, particularly in his own constituency. They were the supreme voice of our generation of Irish republicans. They stand shoulder to shoulder with the greatest of our kind in the pantheon of Ireland’s bravest and best. Their courage, determination and selflessness is unsurpassed by the deeds and lives of the deservedly revered of previous generations. 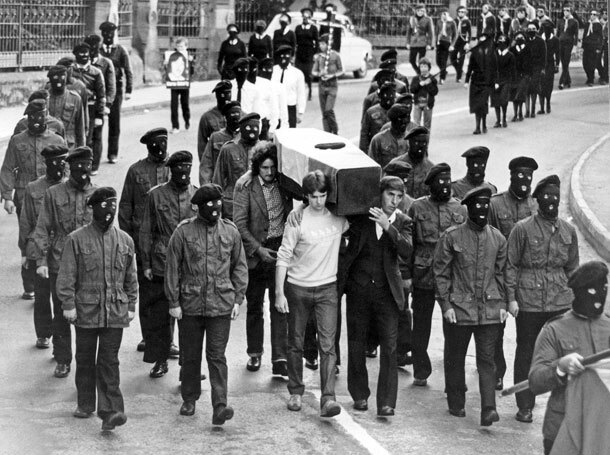 The dignity of their bearing, despite all the pressures directed at them; their tenacity, despite their keen awareness of the journey they had embarked on; their willingness to make the supreme sacrifice, knowing that, in the words of Bobby Sands, “What is lost in here, is lost for the Republic” – all this humbled us and yet filled us all with pride. The stand they took and the deaths they suffered was for the cause of the Republic, the Republic declared in Easter Week 1916, the still unrealised Republic of Tone, of Pearse and of Connolly. The impact of their deaths across Ireland was seismic. The four months of May, June, July and August 1981 were unprecedented in the long story of Ireland’s struggle for freedom and self-determination. The unfolding events in the hell-holes of Long Kesh changed the life-paths of many and, in time, would change the course of Irish history itself. Today, built on the conviction of our people and the justice of our cause, and ennobled by the sacrifices of Bobby, Francis, Raymond, Patsy, Joe, Martin, Kevin, Kieran, Thomas and Michael, stands a resurgent republicanism with Sinn Féin in the vanguard for change and for the realisation of our destiny as an island nation. Let no one fear to speak of 1981. All has changed, changed utterly. It is arguable that nowhere has the impact of 1981 been more demonstrably in evidence than in County Monaghan. With County Cavan, these Border counties responded to the plight of the republican prisoners in Long Kesh and Armagh Jail with the formation of action groups throughout 1979 and in 1980. While Sinn Féin and Republican Movement voices were hugely influential, they did not exercise dominance over the development of this emerging parallel structure. Other voices from across a range of political backgrounds were also involved. This broadbased approach, and sticking firmly to the prisoners’ demands helped widen the appeal of the developing campaign. 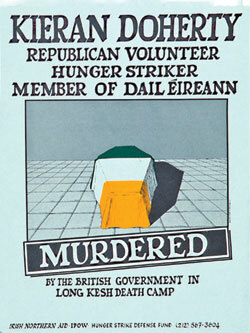 The 1980 hunger strike commenced on 27 October 1980. Among the seven who embarked on that hunger strike were men with strong personal or family connections with County Monaghan. Seán McKenna, since deceased, was the son of Seán ‘Atty’, one of those subjected to the notorious ‘hooded’ treatment by the British Army and buried at Clara in his native north County Monaghan. Séan Senior’s funeral was the occasion of disgraceful conduct on the part of the Garda and Special Branch at the behest of the Dublin government of the day. Tommy McKearney, from Moy in County Tyrone, had a long association with Monaghan and was a highly-regarded Irish Republican Army Volunteer. His family suffered terrible loss over the course of the conflict for their staunch republican beliefs. And Leo Green of Lurgan was a brother of Volunteer John Francis Green, who was murdered near Castleblayney in County Monaghan by undercover British forces. Leo’s brother, Tom, and his wife and family live in County Monaghan. Every possible action, protest and lobby was undertaken locally and nationally. An almost weekly column – H-Block/Armagh News – appeared in our local newspaper, The Northern Standard, as did reports of mobilisations, many with photographs. Letter writing to prominent figures in political life, to church leaders of all denominations, to trades union representatives across the region and nationally, to media influences north and south of the Border, and to influential Irish Diaspora voices globally, but most especially in the United States, were all part of the workload undertaken. 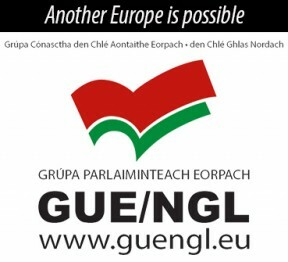 The first hunger strike ended on 18 December after 53 days. The initial seven had been joined by 30 more men in Long Kesh and by Mary Doyle, Mairéad Farrell and Mairéad Nugent in Armagh Prison. The decision was taken on the understanding that proposals contained in a document would be interpreted appropriately and implemented. Once again, British treachery ruled the day. In the local elections of 1979, Sinn Féin in County Monaghan failed to impact. The party lost its sole seat on Monaghan County Council and returned only two Urban District councillors: one in Clones and one in Monaghan town. A former Sinn Féin councillor was re-elected to Castleblayney UDC but as an ‘Independent Republican’, a consequence of internal strains within the organisation locally at that time. 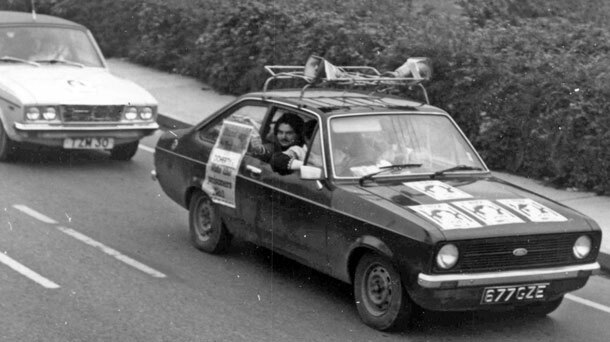 The long-standing Frank McCaughey in Clones and newly-elected Jim Lynagh in Monaghan were Sinn Féin’s only elected standard bearers in County Monaghan out of the 1979 contests. The Monaghan Town seat would become vacant during the term with Jim’s imprisonment and remained so until the 1985 local government elections. Not one of the other eight councillors would propose the notified Sinn Féin replacements, including the former Sinn Féin member of the body, Vincent Conlon. Volunteer Jim Lynagh would, following his release and return to active service, lose his life in a hail of British bullets at Loughgall in neighbouring County Armagh. On 1 March 1981, Bobby Sands embarked on the second Long Kesh Hunger Strike. The support structure across Monaghan and Cavan had been maintained and strengthened. Yet there was great apprehension and not everyone was of the view that this was the way to go. They were fearful of the possible outcomes. We had established central offices in Monaghan town and Cavan town. Caravans were placed in a number of key locations in these and other towns that allowed activists meet and plan and conduct 24/7 vigils, irrespective of the weather. The H-Block/Armagh campaign in support of the prisoners’ five demands was ever-present in the lives of the people of Monaghan and Cavan through all those months. Thousands responded positively and generously; others loathed us and what we stood for. 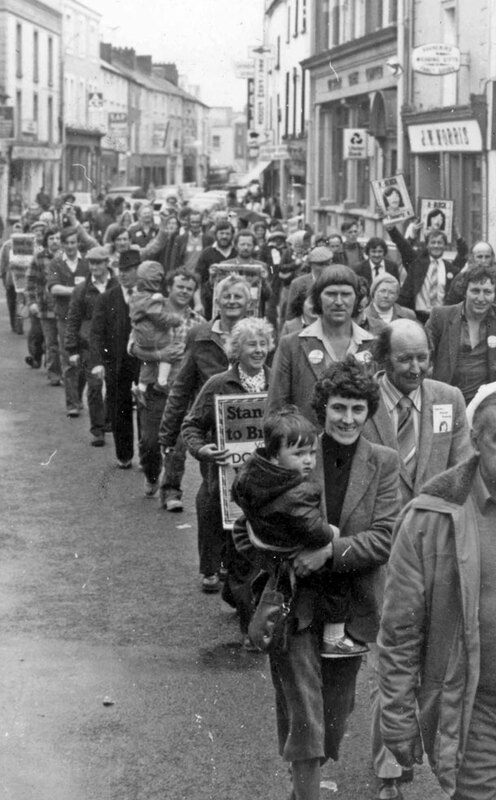 Despite the worst the state could do and the excesses of the Special Branch, despite the condemnations of senior Catholic Church voices and the insidious efforts of those who did all they could to undermine us personally in our respective workplaces, and in a variety of other ways, the overwhelming number of Monaghan and Cavan Action Group members not only stood strong but their resolve grew stronger by the day. Bobby was joined by Francis Hughes on 15 March and by Raymond McCreesh and Patsy O’Hara on 22 March. On 9 April, Bobby Sands, IRA Volunteer from Belfast and, up to his embarking on hunger strike, the Officer Commanding the Irish Republican Army prisoners in Long Kesh, was elected the Member of Parliament by the voters of Fermanagh & South Tyrone. It is not possible to properly convey the impact of the news of Bobby’s success. Elated, overjoyed, hardly do justice to the feelings experienced by our activists and supporters. It was a very special moment in all our lives. It would be easier to describe the reaction of unionism and anti-republican voices on this side of the Border. The intensity of their hatred grew exponentially with our success. Surely now the pressure to resolve the outstanding issues would move British Prime Minister Margaret Thatcher? Surely no one would have to die to win the five demands and the restoration of political status? Volunteer Bobby Sands MP died on hunger strike on 5 May. On 11 June 1981, 9,121 electors across Monaghan and Cavan made 25-year-old Kieran Doherty, an IRA Volunteer from Belfast and then 21 days on hunger strike in Long Kesh, their Teachta Dála. This was a phenomenal achievement. The general election in the 26 Counties also saw the election of fellow republican prisoner Paddy Agnew in the neighbouring constituency of Louth. Other prisoner candidates, including three who would go on to die on hunger strike, recorded significant results in constituencies across the state. The special relationship that Monaghan and Cavan forged over those difficult months with the families of those who died – but very particularly with the parents, brothers and sisters of Kieran Doherty – lived on and grew over the years that followed. Mother and father Margaret and Alfie became a special part of what we were and what we undertook and sought to achieve. The courage of their son, the dignity of his parents; the impact of these qualities has remained with us over these past 32 years and have, with the spirit of Kieran and all those who died with him, inspired and motivated us to strive ever harder and to always remain focused on the attainment of our republican goals. We are a mighty force. We are of the legacy of the martyrs of 1981. Onward to victory.